Some people are in for a shock when they read this post. These exercises are probably not what you had in mind when considering the most effective ways to train your chest. Nevertheless, this is the truth – with scientific confirmation. If you haven’t seen my recent post on the 3 best bicep exercises, make sure you do so after reading this. NOTE: all the following chest exercises are a part of my free THT training program. It comes with a free THT Exercise Bank of approved substitute exercises for ALL body parts. Grab the training package below and become a part of my growing community). There are some great exercises for the chest. But the debate usually centers on whether we should use a barbell or 2 x dumbbells. There should be phases of your training when you use both, but technically speaking, it seems that dumbbells allow for more muscle fiber recruitment across the chest. The Bompa, Cornacchia study showed a 4% difference in favor of dumbbells. And it was the decline position recruited most fibers. This is why I have the Decline Dumbbell Bench Press as the primary chest movement in THT training, much to the surprise of some people. However, THT is a scientific training methodology for producing size gains; it is not wedded to tradition or people’s mere “opinions”. Here’s my video demonstration for doing Decline Dumbbell Bench Presses effectively (please note that my bench IS declined – the angle of the video kinda makes it seem flat – although a steep decline is not required for this). Make sure you subscribe to my YouTube channel for all my new videos. Now this study didn’t test dips. Dips are awesome. Dips should have been tested. They actually work the chest with the same mechanics as a decline or dumbbell bench press. That’s why they are interchangeable in THT training. If you don’t know the difference between chest and tricep dips, read my post on that here. With deep dips, you can add weight and reach failure in the most hypertrophic rep range – 8-12 reps per set. In this particular study, dumbbell chest flys came in at 84% fiber activation. However, they used the traditional and less effective form. I have found a MUCH better way to get these done. A full range actually takes tension OFF the chest for the majority of the movement (the top half) – this decreases muscle fiber recruitment. Doing this short range creates a state of “constant tension”, which maximizes muscle fiber recruitment. Now all you have to do is take each set to failure to stimulate maximum muscle growth. See my video below to see the depth and constant tension I employ to generate a much higher level of muscle fiber activation. Another benefit is that with a partial movement, you can use heavier weights and overload the muscle even more. Yes flat barbell bench presses are a part of the THT training program. They scored just 2% lower than a flat dumbbell bench – 87% to 85%. You’ll find them in the exercise bank list of recommended exercises for when you want and/or need to switch things up. I recommend making these changes between every 10-wk THT training cycle. If you have at least a year’s training experience under your belt, I highly recommend you check out my Chest Blast Workout. This training package includes advanced techniques you’ve never used or even heard of before. My “guinea pigs” achieved results ranging from 0.5″ to 3 inches in a short period of time (see here for full list of results). It involves a MASSIVE jump in intensity – beyond anything you’ve ever experienced. I call it “hyperintensity”. NOTE: I just wanted to remind you all that you can track and log your THT workouts using a free app called Bodyspace. Just download it on any device and search for THT or MuscleHacker. To ensure it’s the official THT routine that I have uploaded, make sure it’s by username: MuscleHacker. Interestingly…and this is awesome…I recently interviewed Skip La Cour for a new MuscleHack podcast. Yes, THE Skip La Cour. We went through each body part to discuss the most effective exercises and for the most part he picked dumbbell movements. I won’t tell you any more right now as I want you to listen to the full podcast…coming later this week! Subscribe to the podcast show on iTunes to be notified when it’s ready to listen to. But I’ll let y’all know by email and social media, also. Try this! It’s a new 24-reps, high-intensity method to build bigger biceps. It’s a set split into 3 x 8rep sections with no rest in between! What My Mother Said To Me! How Did This 40+ Guy Get A Youthful Six-Pack? MuscleHack Community Forums Are Here! Very useful info here bud. Loved the science here. Science > tradition. Exactly! Thanks Mark. Will try out the partial chest fly. @Kyle. 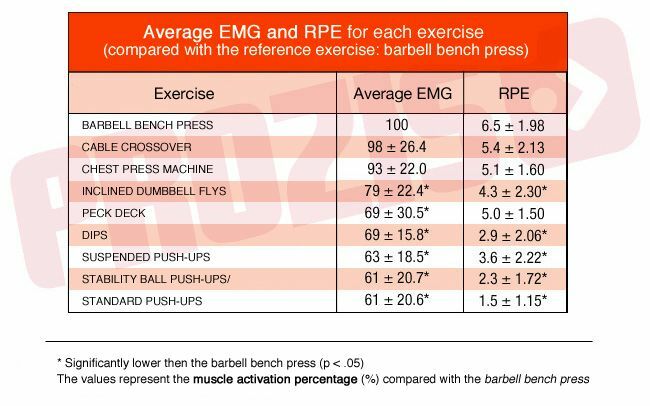 I didn’t see any EMG tests in that link .But if dips are tested, it would be the regular form that most people use – more like a tricep dip which doesn’t involve the chest enough. That’s why I recommend deep dips for the chest. They need to be dip. As stated in the article, they involve the same biomechanics as a decline press, which EMG results have shown recruit most fibers.